In the Internet of Things movement, people across the globe are connecting their stuff – TVs, pets, even houseplants – to the internet and transmitting all sorts of data. The real benefit of using this microcontroller is that it’s only $4 US, whereas many other micro-controllers are 10X that price. It can also be easily programmed in the universal programming language, C++. 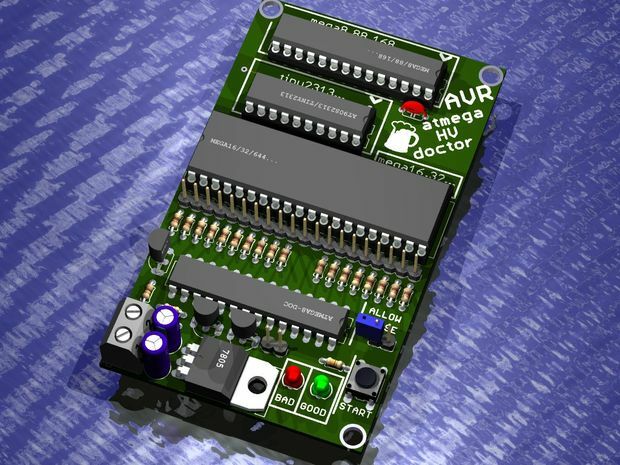 The ATMega is also equipped with a decent amount of memory for any project. Applications for the ATMega continue to grow across the global tech sphere. Today, it’s mostly used in simple machines to receive, interpret, and output information. 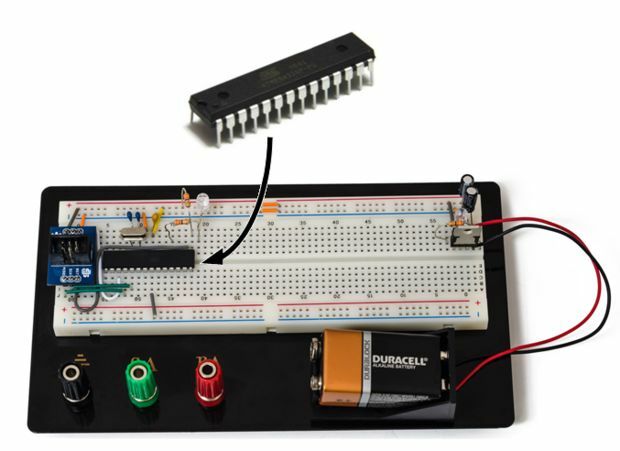 You may have seen the ATMega used in small machines like RC cars and robots. It can make them autonomous and allow these devices to get from point A to point B on their own.Thus, for its size and its cost, this is a powerful little device. Jaycon Systems is here to equip you with the know-how to put it to use! For our demo, we’ll use the basic 5V power supply created by founder and friend, Jay. Above you can see a picture of the circuit. 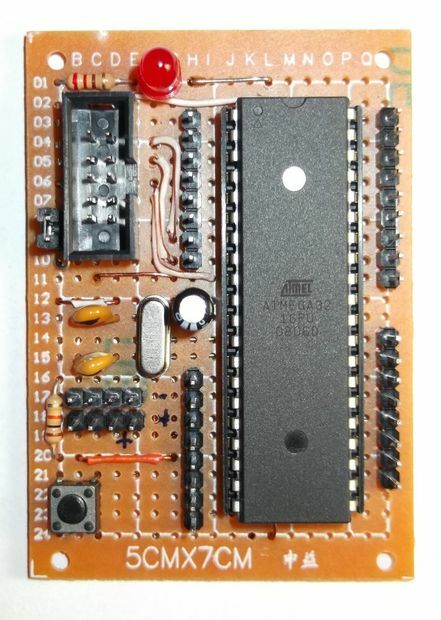 The ATMega328P is a microcontroller with 23 IO pins, two 8-bit internal clocks, and 32kB of flash memory. To begin, notice the notch that indicates the direction of the chip — and the dot that indicates Pin 1. All pins that follow suit are in regular numerical order. 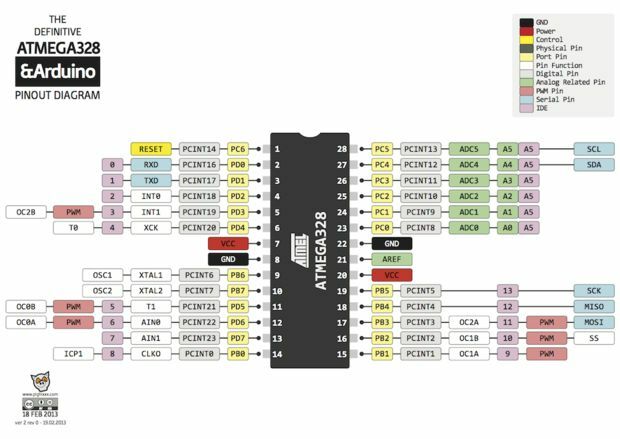 If you are having trouble with the layout, check out the ATMega328P Datasheet for more information regarding the connections, and the ATMega’s abilities. Add a wire from Power to Pin 7 (Power) and a wire from Pin 8 to Ground. Then, add the 0.1µF Ceramic Capacitor to Pin 7 and Ground. Add a LED to the first available row next to Pin 1 that is not already being used by the ATMega. Add a 330 Ohm Resistor from Pin 1 to Power. Pin 1 is the reset pin. Then, add another 330 Ohm Resistor from Pin 4 to the row that the LED is connected to. You have now powered the LED. Note: The power applied from the Resistor to Pin 1 controls what “LOW” should be so the ATMega doesn’t constantly reset itself. The LED also needs the resistor so the ATMega doesn’t kill the LED. 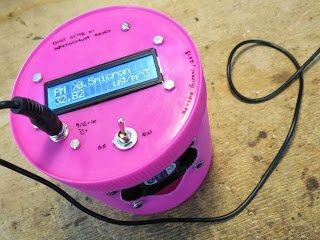 The ATMega’s clock is slow and unreliable because it’s not constant. 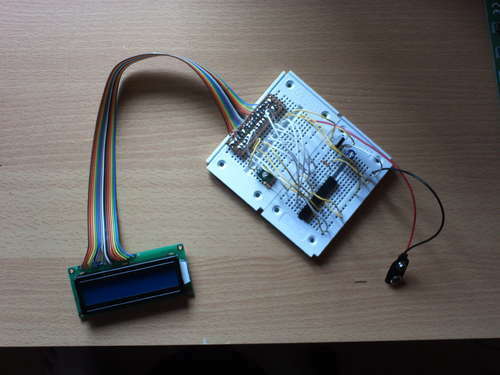 Let’s add a crystal clock that will speed it up and make the ATMega more reliable. Add the Quartz crystal clock to Pins 9 and 10. Then, add a 0.1 µF 50V Ceramic Capacitor from Pin 9 to Ground, and another one from Pin 10 to Ground. You now have a working circuit, and need the programmer. Solder the programming adapter together and place it on the board. Make sure that you place parts in the correct direction, and be careful handling hot tools. The next step is to wire the programming adapter. You can take any path to wire it in, as long as you use the correct pins. Optional: If you are going to power your ATMega with the programming adapter, then wire from the “GND” and “+5V” pins on the adapter, across to the power rails. Here is the Pin map for wiring the rest of the adapter: 17 to MOSI; RST to 1; 19 to SCK; and 18 to MISO. The USBTiny has a small switch on it labeled “NO POWER” and “POWER TARGET”. 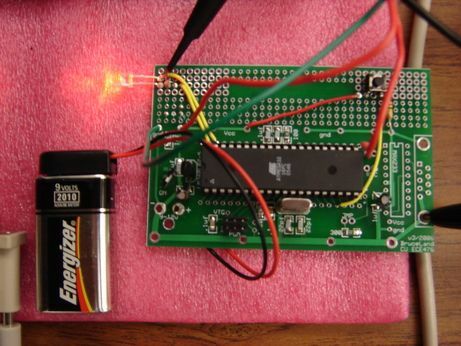 To power the ATMega from the USBTiny, set it to “POWER TARGET”. Not interested? Simply set it to “NO POWER” to avoid unintentional destruction. Now that we have the board completely built, let’s program it so we can make the LED blink. Once it blinks, you know that you have properly built the board. First, we need to make the ATMega use the clock that was just installed. Download and install WinAVR from this page. WinAVR is a full suite with a compiler, programmer, debugger, and more! Use these for the USBTiny. It will include Programmer’s Notepad, which is what we are going to use to program the ATMega, the AVRDude, and will burn fuses and act as a backup for programming the ATMega. Find “Run” on your computer, type in “cmd” and click “OK”. -B sets the clock rate. We are setting it to 25 because the current clock is much slower than the clock on the programmer. -U Is a memory operation, lfuse selects the low fuse, w tells the program to write it, and the hex code (0x##) is the fuse value. This is repeated for the high fuse and extended fuse.